It is that time of year again when we pull out the elastic pants, gather around a table, and eat more food in one sitting than what is probably humanly possible. Yes, that is right, Thanksgiving is around the corner, and for nearly 45 million Americans who diet each year, according to CBS News, this holiday can be dreaded by most. It has become easier, however, to stay on track while dieting due to the enhancements in technology. According to the Mayo Clinic, research shows that people who count calories are more likely to lose weight than people who don’t. Many people do not know their calorie intake or the fat content of food, but by easily accessing it from smart phones and iPads this has become a much easier task. People now have information at their fingertips, resulting in making healthier choices regardless of location, which is the basic idea behind the” Lose it” app. Fortunately, there is no shortage of health apps that help monitor everything from sleep patterns to calorie consumption. Since there are different apps that accomplish the same tasks it is difficult to choose which one is best. Researching the top health apps is the most important thing to do when inquiring about such a serious undertaking — your health. One of the top-rated health apps is called Lose it, according to All Things D. This free app can be used on a smartphone or iPad, and is fairly easy to use, only requiring a few short steps. First the app asks for general information such as gender, weight, and most importantly, goals you want to achieve so that the app can calculate accordingly. On a daily basis it is important to then add in the meals eaten throughout the day along with any additional snacks consumed. When entering in the food it is possible to search by the brands if it becomes difficult to find the type of food needed. An additional bonus is the ability to scan barcodes which automatically adds the nutrition information into the log. Although the first few times entering in food choices can be time-consuming due to the fact that nothing has been recorded in the history, it eventually gets quicker. Eventually the app begins saving the food items that are frequently being recorded. 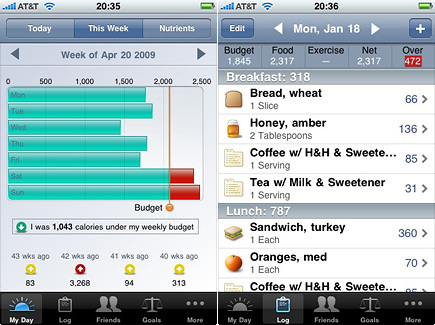 The app also makes it easier for people to make quick decisions about their food choices because of the calorie budget. It causes less hesitation and helps resulting in falling back into old habits. This is an intuitive app that assists people in making some of those difficult decisions when it comes to deciding on what to eat. Instead of anticipating the intense workout following something as small as an unhealthy meal or something as large as a Thanksgiving feast, it can be avoided from the beginning. The Lose it app can help you make healthier decisions that you won’t regret later, at your own convenience. ”Like” Innovative PR on Facebook, follow us on Twitter, and start Pinning with us! their summation at today’s rock bottom. make the mistake of believing the DVDs are an acceptable replacement.